Create a Personalized 12-Month Bound Wall Calendar. The Wall Calendar Kit includes special double sided calendar paper with prepunched holes, plastic coil binder, cover page, and more. 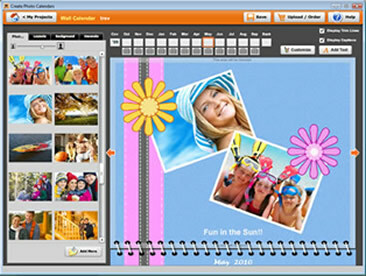 Use our popular EZ Photo Calendar Creator Software or your existing calendar creator program to create your calendars. The CD Case Calendar is sure to be a big hit with friends and family. Place one on your desk, hang one the fridge, or stick one on your cubicle wall. The cd case calendar kit includes pre-cut paper, plastic calendar holder, and more. 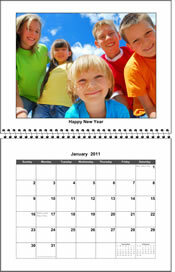 Use our popular EZ Photo Calendar Creator Software or your existing calendar creator program to create your calendars. Pre-printed and bound 12-month themed photo calendar. Professionally printed on heavy weight 80lb gloss cover paper and bound with a sturdy plastic coil binder. 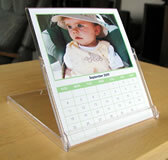 Simply glue or tape your photos onto the calendar and write in your special dates. Makes a great gift and very easy to do - no computer needed. Copyright 2014 Spectrum Software. All Rights Reserved.